Having Ukrainian family members has introduced me to much novelty. To cite examples: playfully calling someone silly a “banyak”, which directly translates to “cooking pan”, the extremely different Cyrillic Ukrainian alphabet (Я gives the sound “ya”, в is pronounced “V”, ч is pronounced “ch”, and so on and so forth), the fact that you can allllllmost make any word Ukrainian by simply adding -ski to its end (cabbageski rollski – yup), learning more about Ukraine’s crisis-tainted history, and of course, being exposed to a multitude of Ukrainian delicacies – borscht, cabbage rolls (called holubtzy), perogies, kolbasa, etc. Ukrainian cuisine has been influenced by many a countries: Russia, Poland, Germany and Turkey. It tends to include lots of fresh produce (specifically cucumber, tomato, potato, cabbage and beets) but also be quite rich and revolve around meat, high-fat dairy (butter and sour cream) and starches. голубці (holubtzy) are a staple in Ukraine as they are cheap and nutritious. Also, for practical housekeeping, cabbage rolls can be made in large quantities and frozen for later enjoyment. 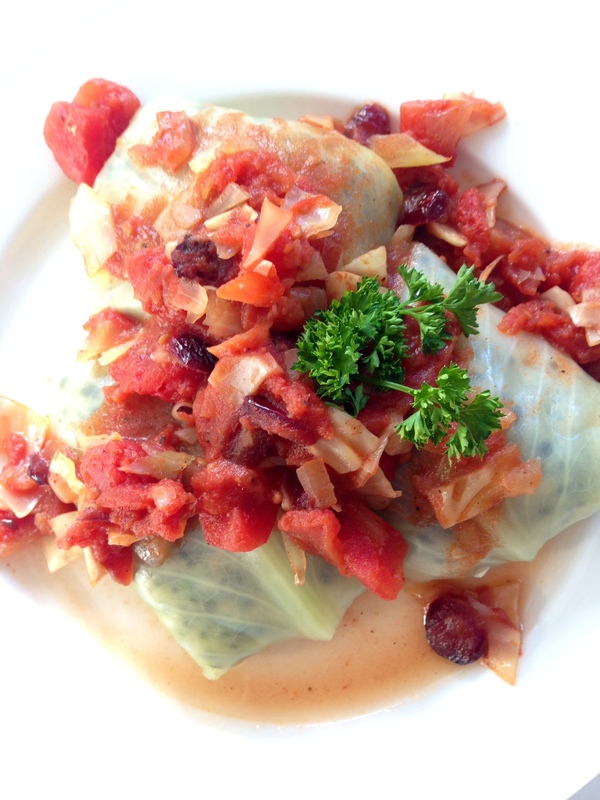 Cabbage rolls are different depending on the region in Ukraine where they are prepared (or apparently if they are prepared in equally freezing Montreal 😉 ). 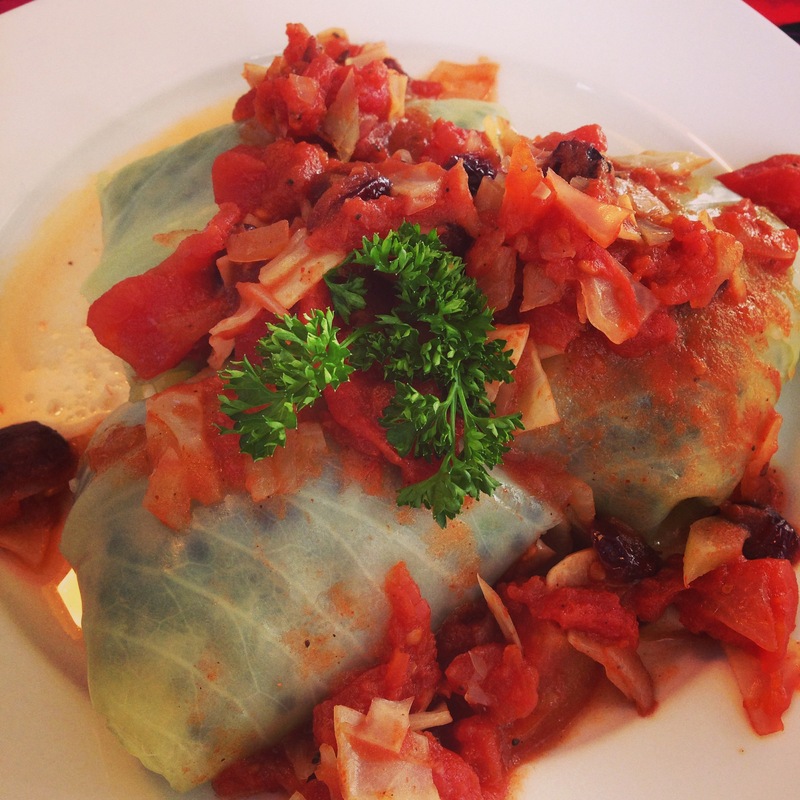 Today’s cabbage roll recipe is rather unconventional in that it is vegetarian (Scram pork/beef/red meat of all kinds! ), white rice is swapped for its brown counterpart and dried cranberries have joined the party. Hopefully my version will get a Ukie stamp of approval. This recipe is a double black diamond when it comes to difficulty/patience. And while I may stay far away from double black diamond ski slopes, I love challenging recipes. In the spirit of full disclosure, I must warn you that the rolling of the cabbage leaves can be time-consuming. However, it is well worth it, in my occasionally patient opinion. In this here recipe, the flavours are perfectly balanced (the recipe must be a “libra”, tee hee) – tomatoes and cranberries confer sweetness, lentils provide nuttiness, the herbs provide freshness and cabbage provides…cabbaginess? All to say, this recipe’s a keeper. Trick of the trade: If you have extra rice and lentils left over, you can make “lenivye holubtzy” (lazy cabbage rolls). Translation? Chop up the remaining cabbage (what is left after you have removed about 12 leaves and it becomes difficult to remove further leaves), mix with parsley, lentils, rice, garlic, etc. and eat as is, without wrapping this in cabbage leaves. To prepare the cabbage, pierce a hole through the center of your cabbage with a strong knife so as to core it. Cut into its depth roughly 3 inches. Add water to a pot (bagnac 😉 ) that is large enough to hold the cabbage and bring to a boil. Once water is boiling, add whole cabbage head to blanch it. Cook for about 10 minutes or until leaves start to naturally pull away from the heart. At this point, remove from heat and allow to cool. During this time, prepare the tomatski sauceski. Add to a frying pan the olive oil, tomatoes, garlic cloves, salt and pepper and lemon juice. Cook on medium heat, stirring occasionally. 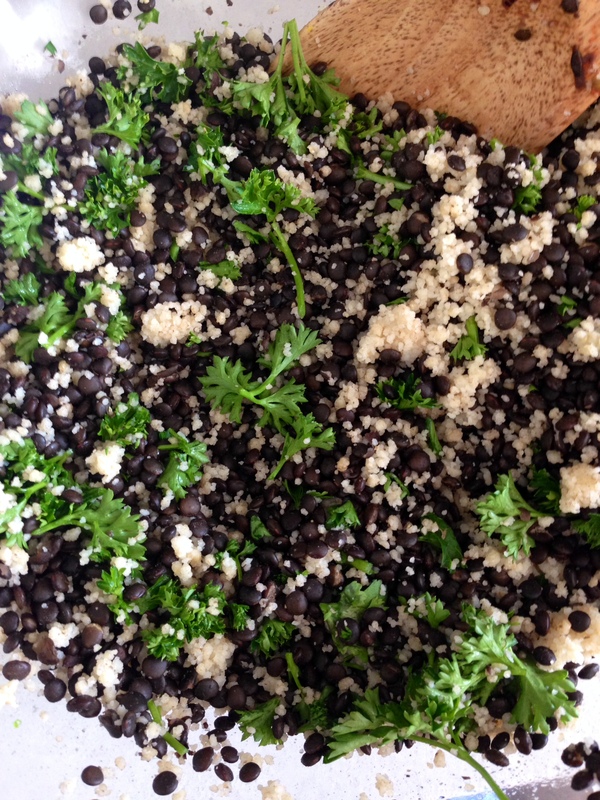 In a large bowl, mix the lentils, rice, garlic, parsley and spices. Go back to your cabbage and start pulling the leaves (about 12) away from the cabbage head, one at a time. Place about 1/3 cup of your lentil/rice mix into each cabbage leaf, fold all corners in and roll tightly. Add half your tomato sauce to the bottom of a heavy duty oven-safe pot. Place all cabbage rolls seam-side down into this pot over the tomato base. Top with remaining tomato sauce and bake in the oven at minimal heat for 45-60 minutes or until cabbage is tender, being mindful of avoiding burning of the holubtzy bottoms. 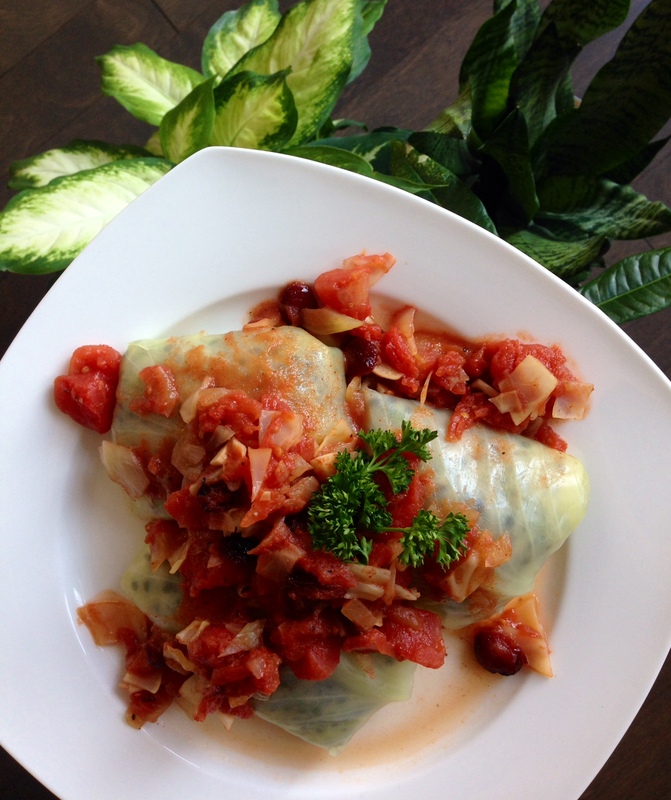 Dinner is served (3-4 cabbage rolls per portion is a good idea)!